The rows indicate whether robots will take over existing jobs or make new ones, and the columns indicate whether these jobs seem (at first) like jobs for humans or for machines. The explanations of the various quadrants shows just exactly why the union movement is ultimately doomed…simply put their member will all be out of jobs because by and large robots will replace the mundane and poor skill jobs first. Let’s begin with quadrant A: jobs humans can do but robots can do even better. Humans can weave cotton cloth with great effort, but automated looms make perfect cloth, by the mile, for a few cents. The only reason to buy handmade cloth today is because you want the imperfections humans introduce. We no longer value irregularities while traveling 70 miles per hour, though—so the fewer humans who touch our car as it is being made, the better. Same goes for Google’s automated self drive cars. 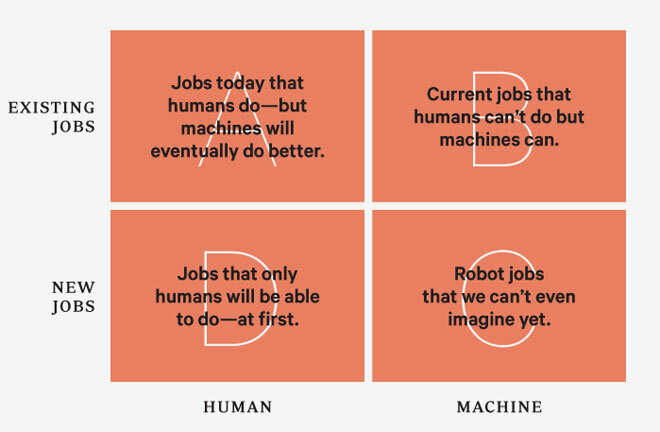 Next is quadrant B: jobs that humans can’t do but robots can. A trivial example: Humans have trouble making a single brass screw unassisted, but automation can produce a thousand exact ones per hour. Without automation, we could not make a single computer chip—a job that requires degrees of precision, control, and unwavering attention that our animal bodies don’t possess. Likewise no human, indeed no group of humans, no matter their education, can quickly search through all the web pages in the world to uncover the one page revealing the price of eggs in Katmandu yesterday. Every time you click on the search button you are employing a robot to do something we as a species are unable to do alone. While the displacement of formerly human jobs gets all the headlines, the greatest benefits bestowed by robots and automation come from their occupation of jobs we are unable to do. We don’t have the attention span to inspect every square millimeter of every CAT scan looking for cancer cells. We don’t have the millisecond reflexes needed to inflate molten glass into the shape of a bottle. We don’t have an infallible memory to keep track of every pitch in Major League Baseball and calculate the probability of the next pitch in real time. We aren’t giving “good jobs” to robots. Most of the time we are giving them jobs we could never do. Without them, these jobs would remain undone. Robots are actually performing new jobs, and creating data that humans can enjoy or work with as a result. Now let’s consider quadrant C, the new jobs created by automation—including the jobs that we did not know we wanted done. This is the greatest genius of the robot takeover: With the assistance of robots and computerized intelligence, we already can do things we never imagined doing 150 years ago. We can remove a tumor in our gut through our navel, make a talking-picture video of our wedding, drive a cart on Mars, print a pattern on fabric that a friend mailed to us through the air. We are doing, and are sometimes paid for doing, a million new activities that would have dazzled and shocked the farmers of 1850. These new accomplishments are not merely chores that were difficult before. Rather they are dreams that are created chiefly by the capabilities of the machines that can do them. They are jobs the machines make up. Before we invented automobiles, air-conditioning, flatscreen video displays, and animated cartoons, no one living in ancient Rome wished they could watch cartoons while riding to Athens in climate-controlled comfort. Two hundred years ago not a single citizen of Shanghai would have told you that they would buy a tiny slab that allowed them to talk to faraway friends before they would buy indoor plumbing. Crafty AIs embedded in first-person-shooter games have given millions of teenage boys the urge, the need, to become professional game designers—a dream that no boy in Victorian times ever had. In a very real way our inventions assign us our jobs. Each successful bit of automation generates new occupations—occupations we would not have fantasized about without the prompting of the automation. My son is training to be a game designer. This is an area that we musst focus on. It is a safe bet that the highest-earning professions in the year 2050 will depend on automations and machines that have not been invented yet. That is, we can’t see these jobs from here, because we can’t yet see the machines and technologies that will make them possible. Robots create jobs that we did not even know we wanted done. [T]he jobs that only humans can do—at first. The one thing humans can do that robots can’t (at least for a long while) is to decide what it is that humans want to do. This is not a trivial trick; our desires are inspired by our previous inventions, making this a circular question. When robots and automation do our most basic work, making it relatively easy for us to be fed, clothed, and sheltered, then we are free to ask, “What are humans for?” Industrialization did more than just extend the average human lifespan. It led a greater percentage of the population to decide that humans were meant to be ballerinas, full-time musicians, mathematicians, athletes, fashion designers, yoga masters, fan-fiction authors, and folks with one-of-a kind titles on their business cards. With the help of our machines, we could take up these roles; but of course, over time, the machines will do these as well. We’ll then be empowered to dream up yet more answers to the question “What should we do?” It will be many generations before a robot can answer that. This is not a race against the machines. If we race against them, we lose. This is a race with the machines. You’ll be paid in the future based on how well you work with robots. Ninety percent of your coworkers will be unseen machines. Most of what you do will not be possible without them. And there will be a blurry line between what you do and what they do. You might no longer think of it as a job, at least at first, because anything that seems like drudgery will be done by robots.